This stamp set couldn’t have been more perfect for my needs this week. I just happened to spot it on the Cat’s Pajamas’ site last week and quickly ordered it, knowing that I planned to make cards to present to Trenton’s magic mentors at their magic show tonight. Not a lot of time, but I got the set very quickly (Thank you!) and went about making four of these cards for the mentors. I was inspired by the current Clean & Simple sketch #167 for the card design. I colored and cut out the bunny image and popped it up, along with the sentiment banner, for some dimension. It was fun to layer this card with the different patterns and textures. Thanks for stopping by. 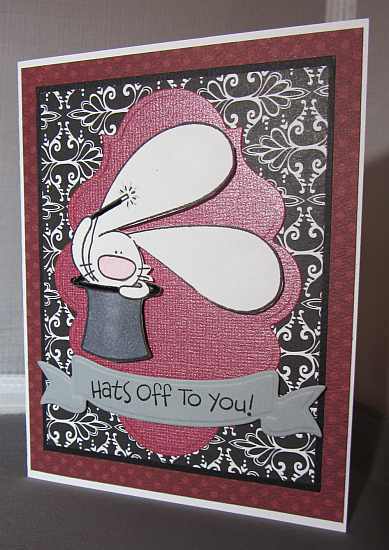 This entry was posted on Wednesday, November 23rd, 2011 at 11:46 pm	and tagged with cardmaking, Cat's Pajamas, clean and simple stamping, fauna, spellbinders, stamping and posted in Clean & Simple, General Cards, TCP. You can follow any responses to this entry through the RSS 2.0 feed.